Thanks are due to Pauline Sigglekow in Wellington for tracing,and obtaining, this photograph. Helen's farewells to her family and friends before her marriage were thought by her to be difficult but they could have been nothing to the round of farewells undertaken by the pair of would be emigrants during the early months of 1863. Selling their house, contents and the belongings that they would not be able to take with them and deciding what would be of most use must have been nightmare enough but saying goodbye to family and friends in the knowledge that, more than likely, they would never see each other again must have been particularly painful. At best, given the distance, they could only hope to exchange one letter a year, two if particularly fast ships were caught in both directions. As we saw from the various family letters quoted above the Bowies, Forresters and Hills appear to have always been a close-knit family where family ties were considered important. Now with a sense of finality they were saying goodbye to people who had meant so much to them over the years. People such as Helen's cousins the Forresters, and Aunt Isobel and Aunt Agnes, her mother's sister who had virtually brought her up and who would be 74 years old when they left, and on David's side his brothers Simpson, James and Andrew. The 'Queen of Beauty' was designated as a clipper ship the definition of which is given by MacGregor as "---any vessel designed to sail as fast as possible and to carry cargo. Clippers could be of any size and rig. Clippers were at their peak in the years 1845--1875. Only a handful of clippers were ever built, compared with the mass of cargo carrying ships sailing the seas." 'Clipper Ships' , David R MacGregor, Argus Books, 1979. Captain Chapman was her Master and she sailed under the British flag. The 'Queen of Beauty' was owned by Fernie Brothers of Liverpool, owners of the Red Star Line, although for this voyage she appears to have been leased to Shaw Savill one of the major companies to ship emigrants to the colonies and this may be the reason for her departure from London rather than Liverpool which was her home port. NOTE See below for a link to the the complete passenger list of the voyage. Given the social standing of David and Helen a natural assumption would have been that, for such a long and arduous journey, they would have travelled in cabin accommodation and shared that with their children. The list of arrivals printed in the Auckland newspaper of the time indicates, however, that that was not so. There were only six cabins on the Queen of Beauty and the Philps are listed as travelling steerage. A reflection surely of how far their fortunes in Scotland had deteriorated prior to their departure. Three days after departure while the passengers were settling down to learn and get used to the shipboard routine not to mention their cramped conditions the first excitement of the voyage occurred when a boy stowaway was discovered. on Captain Chapman's orders and reflecting the harsh laws of the day he was clapped in irons. the passengers taking pity on him took a collection that raised �14 and this was accepted by the Captain as the boy's passage money and he was released and set to work with the first steward. On May 22nd with a head wind blowing and the Queen of Beauty having to tack in order to make any headway the passengers boxes were brought up from the hold and they were able to get access to their belongings, perhaps change clothes. Three events occurred that day to liven up the monotony of a shipboard existence. In the afternoon the only cow on board died and was thrown overboard. An event that would mean no more fresh milk until landfall. An exhausted swallow landed on board and was fed by some passengers before being released. 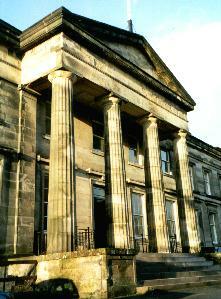 and in the evening the first 'musical' concert was held. The next day the last two pigs died and were thrown overboard. This made a total of eleven in all that had died in the nineteen days of the voyage. a weekly newspaper was started to cover all the news of interest together with articles, critiques, sketches and advertisements. To read the paper cost 1d per quarter of an hour per passenger. After that nothing out of the ordinary happened to create any excitement on board until the 5th of June when, at 5 degrees North and 23 degrees West, the 'Queen of Beauty' met up with and spoke to the 'Arab Steed' and its Master Captain Walker. Meeting another ship at sea was a big event in a basically boring existence, particularly if that ship was heading for Britain as mail could be carried home. Three days later on the 8th of June the Queen of Beauty crossed the equator but, because Captain Chapman had issued an order saying 'no tricks', there would be little of the time honoured ceremony of king Neptune coming on board. The intense heat and the confined conditions seems to have had an adverse effect on some of the passengers because on the 12th of June there seems to have been a row between the Captain and some of the passengers who, it was claimed were making too much noise at night. The Captain's dealing with the rowdy passengers does not seem to have had the full necessary effect because on the very next day a further incident occurred and this time the Doctor showed them the Act of Parliament that authorised him to fine recalcitrant passengers on their arrival in Auckland if, after a warning they continued their antisocial behaviour. This seems to have had a salutary effect for no further difficulties are mentioned. A much more exciting and indeed worrying encounter at sea occurred three days later when, on Tuesday 16th June, the 'Queen of Beauty' was at 22.47 South and 34.47 West, about 80 miles off Rio De Janeiro. About eight o'clock in the evening a sail was spotted ahead. As the ships came close the one ahead fired a blank cartridge as a warning shot across the bows of the Queen of Beauty closely followed by another. Because the Queen of Beauty took no notice a third live shot this time was fired ahead of her. Captain Chapman had the 'Queen of Beauty hove to because this was the feared Confederate Steam Ship 'Alabama' with the infamous Captain Raphael Semmes at the helm. A report giving more detail and a view of the 'Alabama' incident, this time from the deck of the 'Queen of Beauty, is recounted by Mr Robert Farrell, a builder of Auckland who was a passenger on the Queen of Beauty. He tells us that ,after the 'Queen of Beauty' hove to, a boat left the Alabama with an officer and seven men in it. "The crew of the Alabama's boat were a rough-looking lot, and they were armed to the teeth. At first the 'Queen of Beauty' people did not think that the shots were intended for their ship, and they were lucky getting off as they did. It was just a toss-up whether the third shot, which was ball and not blank charge like the first two shots, struck the ship, but fortunately it did not. In 22 months the 'Alabama' travelled over 75,000 miles, captured 55 Union ships valued at more than 4.5 million dollars and released ten other vessels. Eventually in 1872 Britain paid 15.5 million dollars in compensation for the damage done by the three confederate raiders. One can well understand the concern of the 'Queen of Beauty's' passengers that day in June 1863 when they met and were stopped by the Semmes / 'Alabama' partnership off the coast of Brazil. In early July, as the Queen of Beauty sailed south to catch first the winds of the westerlies and later the roaring forties the weather became bitterly cold and the seas rougher. In these gales the passengers cabins were frequently flooded and at times virtually everything from clothes to bedding must have been permanently damp. This was only to be expected as June/July would be mid winter in the Southern hemisphere and the pack ice from the Antarctic continent would be as far north as it comes. This would mean that, for safety, the ship would, at no time, drop down to the 50 degrees south as the most skilled mariners did but went racing along to the east around 44 degrees to 45 degrees south along the great circle route that would make for the shortest journey. On the morning of the 24th of July the ship was saddened to learn that a child had died of congestion of the brain and was committed to the deep in the afternoon sewn up in a piece of sacking and covered woth a large flag. There would not be long to dwell on this sad incident because that day the 'Queen of Beauty' experienced the worst gale of her voyage. Sails were split and on each watch it took four men to control the wheel. We can imagine the state of the Philp family. Incessant noise of both the gale and the passengers and crew, cold and dampness everywhere in extremely cramped conditions with the hatches battened down and virtually no light at all. All around the gale screaming incessantly. Other passengers around them also being frightened and sick. Such stories about the passage east along the great circle route through the 'roaring forties' of the Southern Ocean, are duplicated in virtually every voyager's diary and serve to give the flavour of the conditions and hardships that David, Helen, Margaret, James and Andrew more than likely would have suffered and endured. When we remember that Margaret was only four years old, James two years old and Andrew just over one year old the physical difficulties almost appear to double. Comforting three small children in such circumstances as the 'Queen of Beauty' met during the gale of the 24th July must have tried David and Helen to the utmost. Frequently, I am sure, they must have reached that point of despair where they wondered about the wisdom of their decision to seek a new life in New Zealand and then been forced to rally their flagging spirits to recharge their hopes and dreams. 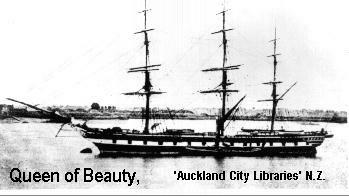 About mid-day on the 9th of August the 'Queen of Beauty' came to anchor in Auckland harbour and at some time on the 10th of August 1863 after 96 days at sea the Philps would have disembarked and taken their first step on their new home.